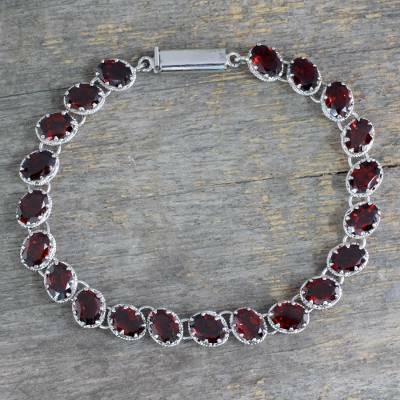 Garnet 21 Carat Tennis Bracelet in Sterling Silver, "Scarlet Radiance"
You can find garnet tennis bracelet 'Scarlet Radiance' by Alok Jain in jewelry categories such as Birthstone Bracelets, Garnet Bracelets, Silver Bracelets, Sterling Silver Bracelets, Stretch Bracelets and Link Bracelets. Enjoy exploring these sections for other Novica treasures. Absolutely beautiful. She loved it, 'nuff said. "Garnet bracelet for my Jan birthday. " Very beautiful. 2 carots of bright red garnets.